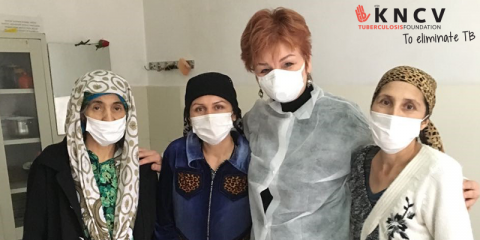 Just before the turn of the year, new hope was provided for MDR-TB patients in Tajikistan. The first patients were initiated on new regimens that previously were impossible to get in this high MDR-TB burden country. At the start of the new year, Kyrgyzstan has also started enrollment of the first patients and more countries are to follow this year. In all of these countries, we strive to curb the global MDR-TB epidemic by extending availability of shorter and better MDR-TB treatment. Many patients will now need to take drugs for nine months instead of two years, in order to be cured from this dreadful disease which leads to so many deaths in the country. Patients with more extensive drug resistance will still need to be treated for a longer duration, but with much better prospects of being cured as a result of the addition of bedaquiline and other drugs to the regimen. Getting to the point where patients can be enrolled and treated can be a long road, political support needs to be built, field operations need to be set up and medical and technical requirements need to be met. The patient-centered approach applied by KNCV and its local partners, and funded through USAID, meant patient safety took center stage through the introduction of drug safety monitoring, training staff and establishing electronic data collection and analysis. KNCV Tuberculosis Foundation the USAID-funded Challenge TB project are proud partners of the Tajik and Kyrgyz National TB programs, and together develop a solid foundation on which future progress can be built. In the following weeks we shall pay extra attention to the developments in Tajikistan and Kyrgyzstan so make sure to check our website soon for more behind-the-scenes stories and information.